This work was painted from the Piazzetta of S. Marco, looking across to the 16th century Palladian church of S. Giorgio: a view which looks exactly the same today as when Scherer executed it. Only the numbers of sailing craft have changed, replaced by motor-boats, vapporetti and an occasional liner. The low viewpoint indicates that the artist probably sat on the walled edge of the piazza, his main subject being the expanse of light-filled, boat-covered water, and the shadows and reflections animating it. As with Expressionist work generally, the aim of the artist is not to convey objective reality (the same view painted by Monet produces an incandescent confection of colour and light, in which the island of San Giorgio appears to be melting into the sky), but the subjective emotion with which he contemplated it. 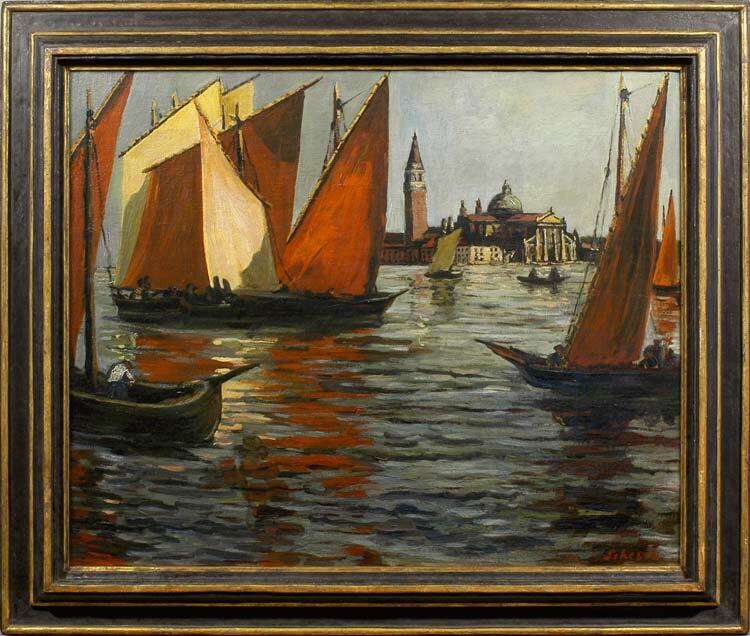 This is therefore an intense and brooding vision of Venice, the sky darkening and the water patterned with the blood-red reflections of sails, like the wings of the Eumenides. Only a few minimal facts seem to be known about Fritz Scherer: that he was born in Friebourg-im-Breisgau, near Baden-Baden, in 1877, and that he studied initially with the Freiburg Painters’ League. Later on he became a pupil of Frans Wilhelm Voigt in Munich, from 1909 to 1910. His teacher seems to have been influenced by Impressionism; Scherer himself, however, was more of an Expressionist. His landscapes are pantheistic, animated by brooding rocks and snowy slopes like the pelts of monsters which may awake at any moment. He travelled in Italy, another of his landscapes being a view of Ragusa, Sicily, and in Austria, where he painted Kitzbühel. He became a member of the Secessionist Movement in Munich, and of the Free Association of Artists around Freiburg. Scherer’s name crops up in the Wilhelm Arntz Papers, acquired by the Getty Research Institute. Arntz (1903-1985) was a German lawyer, art expert and researcher in 20th century art; also one of the early collectors of German Expressionism. As a lawyer he worked on cases concerning the restitution of artwork confiscated by the Nazis, in connection with which he compiled hundreds of pages of notes for a comprehensive catalogue of artworks looted from public collections in Germany. Many of his references are linked to the Degenerate Art Exhibition, held in Munich in 1937; Scherer’s paintings were not specifically included in the 650 pictures shown in the exhibition, but they were amongst the 16,558 works purged from German museums for their ‘degeneracy’. Works in public collections included paintings in the museums in Stuttgart and Munich; Logging on the Walchensee is also notable: it is illustrated in BMM.